This year, I have been overwhelmed by all of the articles about how to undo the damage we are about to inflict on ourselves. First it started with stories about eating too much candy during Halloween. Next, a pre-emptive strike against over indulging at Thanksgiving dinner, followed by binging our way through the entire holiday season, which apparently is one big food splurge, lasting from Halloween to New Year’s Day. The past week’s articles have centered around hangover cures, from the drinks we have not yet consumed on New Year’s Eve. What started as posts about avoiding the indulgences, slowly morphed into stories about planning to fix it all in January. Somewhere, around the second week in December, even the health and wellness writers threw in the towel and moved on to repair tactics. If you live a healthy lifestyle, very little of this is relevant. Yes, Thanksgiving has become a carb fest, slathered in butter and brown sugar, and sprinkled liberally with pecans, but it is just one meal. Truly, how much weight can you gain from one meal? It’s about eating it, enjoying it, and going back to normal healthy eating the next day. Sure, there have been more temptations lately, but if you make wise choices most of the time, a little indulgence is fine. No time to workout? Sorry, I don’t buy that one. Get up, get to the gym and get on with your life. It keeps your stress levels in check, and makes sure that your pants still fit after all those treats. No gym? Go for a walk. Just do something. Next week, the gym will be flooded with the New Year’s “resolutioners.” The ones that vow that this year will be the year they diet and exercise. They fill up the classes, hog the machines, and mess up the locker rooms. They are also gone by the end of the month. I don’t really believe in making New Year’s resolutions. I believe in taking each day as it comes and doing the best I can with it, whether it’s January or July. Instead of setting a big goal that is often unattainable, why not simply commit to doing better a job of taking care of your body and your health? Why not find simple tweaks that can improve your lifestyle, and go from there? Find something active that you love to do, and doing it will become pleasure, not drudgery. Don’t look backwards at the things you can’t change, but try looking forward to the things you can do better. Instead of spending tomorrow trying out that trendy new hangover cure you just read about, why not drink mindfully tonight, and spend the day enjoying all of the possibilities that a new year brings? Here’s to a great 2012, filled with health, happiness and love! Since Thanksgiving, we have had almost non stop guests. Some meals are planned and extravagant, and others are just variations on our every night repertoire. I just finished whipping up one of my simple go to desserts, a Bishop’s Cake. It’s one I have been making for years, since I discovered it in a Silver Palette Cookbook. It’s moist, flavorful and easy to dress up with fruit, ice-cream or sorbet, and it’s great just as it is. Cream 2 sticks of butter with 2 cups of sugar in the electric mixer. Add 2 cups of flour and mix well. Stir in 1 tablespoon each of lemon juice and vanilla extract. With the mixer running, add 5 eggs, one at a time. Pour into the pan and bake it at 350 degrees for 1hour and 15 minutes, covering it with foil after 30 minutes so it doesn’t over brown. Let it cool in the pan before inverting it on a plate. That’s it! Really! It’s that easy and well worth the effort! Add your favorite accompaniments and enjoy! Isn’t it annoying when there is a little money left on your Metrocard that isn’t enough for the fare,and there is no way to retrieve it? 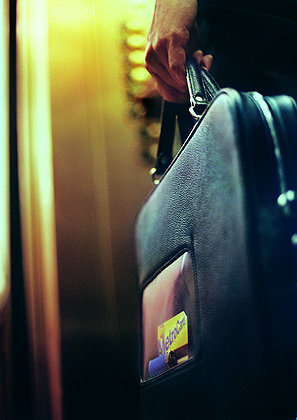 Each year, $52 million is lost when those cards are replaced while there is still a value remaining. Metro Change, is a new system designed to take that lost change and donate it charity. Designed as kiosks to be placed at subway stations throughout the city,Metro Change allows riders to swipe their cards and have the remaining value recorded and put into a central fund. The cards are then taken for recycling. Each month, the central fund is converted into dollars and donated to charity. The Metro Change creators are currently seeking people to help make this platform a reality. Check out their website for more information. This is an easy and tasty side dish that goes great with fish, chicken or meat, and could be the base of a vegetarian meal as well. Chop one onion and saute it in butter over medium heat until it is soft and transparent, and just starting to brown. Add 1 1/2 cups of cous cous, and 2 cups of chicken or vegetable broth. Cover, and cook on a very low heat for about 5 minutes. Add a handful of chopped parsley, and about 1/4 cup of pine nuts. Merry Christmas to you and your family from Indigo Jones and Glasshouse Images. Wishing all of you a very happy, healthy and safe holiday! Paper cups have become a guilty necessity in our busy lives. While all of them can’t be up-cycled in to works of art, they certainly can be improved upon. Designer Peter Herman agrees, and has come up with an alternative design that is both functional and more ecologically friendly. Architect by day, and cup innovator by night, Herman has created a folding cup he calls “Compleat”. 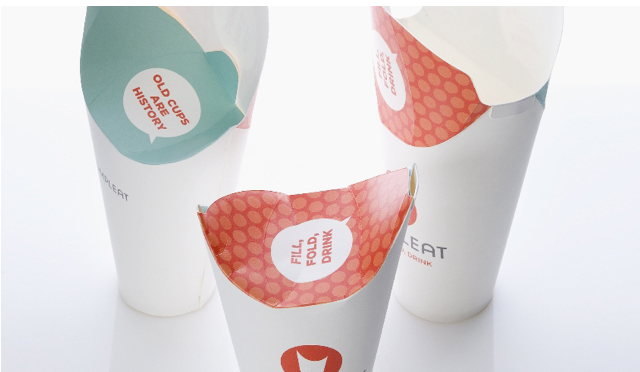 The body of the cup has 2 integrated flaps composed of one piece of paper, which would be coated with a cellulose based compostable plastic to make it waterproof. The top folds to create a spout for sipping, as well as a cover for the beverage. Herman partnered with Daren Bascome to make use of all 3 surfaces for branding messages. The cup is also cost efficient, since it’s one-piece construction allows it to be sourced through a single supplier. The designer believes that the “iconic shape will also show the retailer’s commitment to environmental stewardship”. The cup is still in development with its release date unclear. Ever wonder what happens to all those paper coffee cups that seem to be in everyone’s hands as they walk down the street lately? 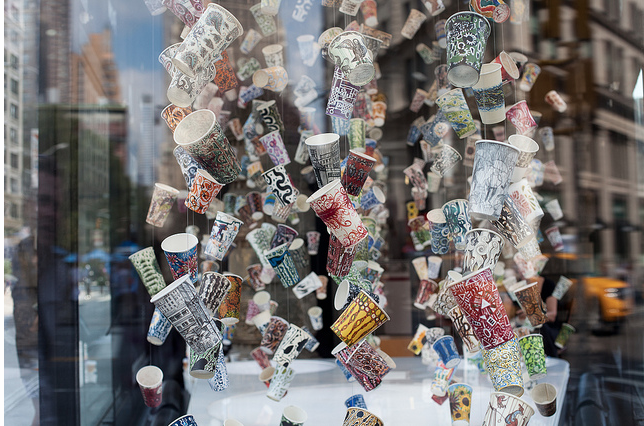 Meet Gwyneth Leech, a New York City artist who is “up-cycling” used cups into works of art. For the last few months, Leech can be found in the Prow Art Space in the iconic Flatiron Building, drawing on cups, and suspending them on wires as part of an installation called: Hypergraphia: The Cup Drawings. Leech collects the cups after use, washes and dries them, and records the date, occasion and place on the bottom of each one. She then uses the cup as a canvas, filling it with intricate pen + ink drawings. The installation can be viewed 24 hours a day at the gallery, which is located at 23rd Street where 5th Avenue and Broadway meet. Gwyneth Leech can be found drawing in the Prow windows Tuesday- Saturday, from 11 a.m. – 2 p.m. through February 18, 2012. Bring her your clean, dry paper cup with your name and the date, written on the bottom, and she will add it to the installation. What a great way to reuse, recycle and rejoice in the beauty of the holiday season!